Simmons Beautyrest NxG Memory Foam Mattress causing me pain. I came across your blog and website today while trying to research the best mattress toppers. Several years ago I purchased a Simmons Beautyrest NXG 400 (CK size) for a good amount of money, at least in my opinion. I chose this mattress due to lower back issues, mainly L5-S1. My mattress was comfortable...for a little while, which seems to be a common theme I've seen in your advice to others. I ended up having back surgery on my L5-S1 in 2011. After that, my mattress seemed to become more and more uncomfortable with each passing day, not only for my back, but for several other joints. Eventually, the pieces of my joint pain came together when I was diagnosed earlier this year with extremely aggressive rheumatoid arthritis at age 35. Along with pain in just about every joint, I also have insomnia and extreme fatigue, as well as frequent migraines, and stiff, sore muscles from medications, pain, stress, etc. I was very excited when I saw your website; it seems that memory foam (with gel temperature control) gets more hype and attention as the "new and best" thing but, I've been leery to purchase one because of some tempurpedic pillows I purchased (also for a good amount of money) that KILLED my neck, jaw, ears...everything! My fiance also has severe allergy issues as well as some back and neck pain. He is 5'11, about 190, I'm 5'5, around 150. I was looking at your 2" Ever Eden Talalay topper along with the Purebliss Latex therapeutic (latex/down) pillows. What would your suggestion/advice be? Also, as a side question, I qualify for a "therapeutic mattress/mattress pad" under my health insurance DME benefits - are you aware if your mattress toppers have ever been considered as "therapeutic" by health insurance companies? It seems any I can find through DME suppliers aren't ones I'd even purchase to begin with, and certainly are not worth wasting my time to fill out insurance paperwork for reimbursement. I'd rather purchase what's BEST out of my own pocket but, it doesn't hurt to ask if you're aware of any prior customers having one approved for medical necessity/therapeutic reasons. Thank you in advance for any advice you can give, as well as your time. I greatly appreciate it. Your Simmons Beautyrest NxG 400 is loaded with memory foam. Memory foam is the worst material ever invented for this purpose. Memory foam has created a boon for the mattress industry and a nightmare for the consumers who buy it. Memory foam is a temperature sensitive material that softens and sags under you once it warms from your body heat....losing comfort and support. The diabolical part of this, is that the memory foam returns to its original shape when you get off of the bed...or, close enough to its original shape, that you won't prevail in a warranty claim. The boon for the industry comes from not having to replace mattresses under warranty. But instead, the consumer has to replace their mattress much more frequently than in the past. Most people don't realize that it's the memory foam causing the problem, since most people in the business talk about it like it's the best thing since sliced bread. And so, the consumer ends up repeating their mistake...over and over again. A latex topper will help, but your mattress has a lot of memory foam in it....junk upholstery that has seen better days. You really can't afford to gamble with your health. My advice is to buy a new mattress and get rid of that one. But this time, avoid memory foam. Here is a link to the Natura Greenspring line...what we sleep on at home...a pocketed coil unit that is superior to the one Simmons makes, and upholstered with natural Talalay Latex. Pure Bliss doesn't claim that their Latex/Down pillow is therapeutic. I put that there...and for good reason. I have arthritis on one side of my neck...had it for years and lived with the pain. When this pillow was introduced, I was given one to try at home. For the first time in years, my neck pain was gone. Since then many people have experienced similar results. It is the best pillow for addressing chronic neck pain, that I've ever come across...and I have tried many different types. Here is the link for those. It's the 2nd pillow on this page. Latex pillows are known for offering superior comfort and support. Order your Pure LatexBliss Organic or Talalay Latex Pillows from The Mattress Expert today! The first pillow is very popular, as well. It is extremely soft and comfy. Because it's latex, you head won't go through it. This blog will provide you accurate information about mattresses and the mattress industry. It is designed to custom fit each person, along with your unique set of circumstances, to the mattress best suited to meet your needs. You will find "Categories" for the blog posts that address each question genre. Highlighted words will also aid you in finding posts that address circumstances similar to your own. In most of my responses, there are links to mattresses that are recommended for that particular questioner. Click on those links and it will take you to the information about that mattress, including: photo, specifications and pricing. If that particular mattress interests you, you can order it on-line or by phone. Any question that you may have, that you did not see answered here, can be asked via email at themattressexpert@live.com You will receive a direct response to your email. Your question and my response to it, will later be posted onto the blog. Visit our website to view the the specifications of the products that interest you...and, to place your order. Will a soft latex mattress topper make me more comfortable? My question is… Do you think adding one of your latex toppers would make me more comfortable? It seems crazy that I would have to add a latex topper onto a very expensive mattress, but if it makes me more comfortable it is worth it. Do you think the topper would in any way decrease my partner's comfort and happiness with the mattress? I bought the mattress from a local furniture store which I like and do business with frequently. I'm not even sure what the return policy is, but since my partner likes the mattress so much I would rather not even try to return it. Your size doesn't allow you to make dent in what you have. This is a common problem for women who are very light in weight. The topper will help you. It softens the surface without sacrificing the underlying firm support. Normally, a soft layer of latex is a welcome addition by anyone's standards. It will also extend the life of the mattress, by absorbing much of your body weight....so, it's far from being a waste of money...just the opposite. accommodate and allow the right body posture and rest before it will "hit" the firm. Thank you in advance for your time and attention to this matter. My wife and I have this same mattress at home. You can see it at Sears. Here's the link. You can order on-line. Delivery is free and there's no sales tax. Latex is the very best material available. The latex we carry is the best of them. So, even the worst of them is better than what you have now. not the couple of years provided by the memory foam you have now. 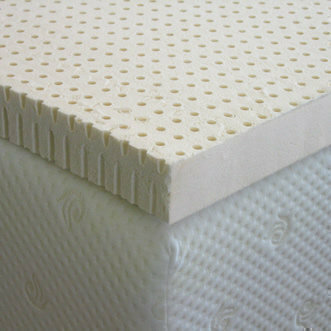 2" of soft Talalay latex is all you need. What in your opinion is the best cal king mattress in something that is very plush and comfortable. Comfort is more important than price. I see the Beautyrest Black by Simmons or the NxG models but every store has different names for their models so it's impossible to compare. Finding a very soft mattress is easy. Finding one that will still feel that way 6 months later is damn near impossible. The poly foams and memory foams used in most of these high end mattresses will break down, compress, over the short span of only months. However, there is a way to get what you want and have it stay that way. The most comfortable and most resilient material is latex. For a very soft feel, add a 3" layer of soft latex to a medium firm mattress for the combination of good support and an incredibly comfortable sleeping surface. My wife and I use a 2" topper on a Simmons Beautyrest Black Ansleigh in plush/firm. The feel of the mattress is so good, I find myself spending way too much time in bed. Here is a link to that mattress and to the latex toppers. Hi, buying a new mattress and wife heard about the NxG series from beautyrest. Has this product been discontinued? If so, how does the black series compare? Wife wants to go with beautyrest and I just want a high quality nights sleep. I have at home. It's the best available in today's market. We hope you can give us some guidance as we purchased a Sealy Optimum Inspiration from Mattress Barn. We don't like it and plan to return it. This foam mattress is too hard; my arms fall asleep and I wake up with a backache each day. My husband just plain hates it. We've had it for 8 weeks, which should be time for it to soften. A local store carries a Stearns and Foster Sonoma pillow top, which is very comfortable (in the store). I zeroed in on this mattress because it supposedly has "smart latex" in the pillow top. However, I, of course can't get an accurate review on it because of all the names of mattresses. What do you know about this Sonoma mattress? Will the pillow top, like others I've read about, break down quickly? This is a prime example of the mis-information that you get from undertrained sales people. The latex is not in the pillowtop. The pillowtop is filled with poly foam. The layer of latex is just above the coils and nowhere near the top. Opt for that same mattress in a plush tight top and you will spare yourself the fate of all the other pillowtop owners. Thanks for the quick response Pete. Today, we looked again and my husband loves the Simmons Tru Energy Plush Sallie (Yvette). We are 73 and 68 years old, normal size, and he really wants a soft feel. The salesman says this is the only pillowtop that won't sag because it has NXG foam in the pillowtop. I haven't found reviews on this mattress, maybe because the Simmons Recharge System is new? My head is spinning with all the research! We just can't justify spending all this money on a king mattress, then $449 more on a topper! What do you know about the Simmons Sallie? Here's all the justification you'll need. Simply put, a latex topper works, while pillowtops fail. I'm not a "tell you what you want to hear", kinda guy. You can find that at any mattress store. Here, we "tell it like it is"...and, for your own good. We just purchased the Simmons Beautyrest Black plush/firm Kelya. I'm not sure that's the best mattress and I feel we overpaid. I'm thinking of cancelling the order but I'm in a hurry and need new ones delivered by Saturday at the latest as we are being reassigned overseas. I have lower back pain from a separated disc and had knee replacements this year. When I sleep on my side my arms fall asleep.. I also have a hiatal hernia and am a side sleeper and back sometimes. I have not had a good nights sleep in years. I love the soft feel of a cloud on my aching bones but know I need support for my back. Did I purchase the right mattress or should I cancel? I can tell you that it is a good mattress. I don't know if it's the right mattress for you or if you overpaid. I can tell you that being in a hurry puts you at a major disadvantage. You are much more likely to make a mistake and be taken advantage of, when you rush to make a decision. We recommend the Ansleigh luxury firm as a "Best Buy" in that line. I can't thank you enough for your blog. Its already saved me from the dreaded Memory Foam mistake and helped me to realize that I need a firmer mattress than I currently own. I'm considering a Beautyrest UltimateFirm model - what you call the Dartmouth. I am female, 5'2" 130 lbs, 55 years old with some minor back issues. Like almost everyone, I'm on a budget, but don't want to be miserable for the next 10 years. (My seven year old BackCare mattress is way too soft). Is there enough of a difference in quality to justify spending more money on the Montewicke or are the differences more cosmetic in nature? One of the more common mistakes is in over correcting...doing from too firm to too soft and visa-versa....and I wonder if that may be that case here, with you. If you go extra firm, you are sure to need a soft latex topper to go with it for the surface comfort. You might also consider the World Class Annapolis Place in luxury firm. Of course, this is me anticipating a problem. If you like a hard mattress, then the Dartmouth Ultimate Firm is a good choice.